One of the great commuter shows in the country -- especially among the commuter operations run by a state agency and not a classic railroad -- was along the northern New Jersey coast in the early 1980s. The New Jersey Department of Transportation's North Jersey Coast Line (also known by its legacy name of the New York & Long Branch) was operated by Conrail under contract for NJDOT, with the state agency supplying equipment. The NY&LB was shared by two railroads -- the Pennsylvania Railroad and the Central Railroad of New Jersey, both of which became part of Conrail in 1976 -- and into the NJDOT years the trains from the two railroads maintained separate looks. 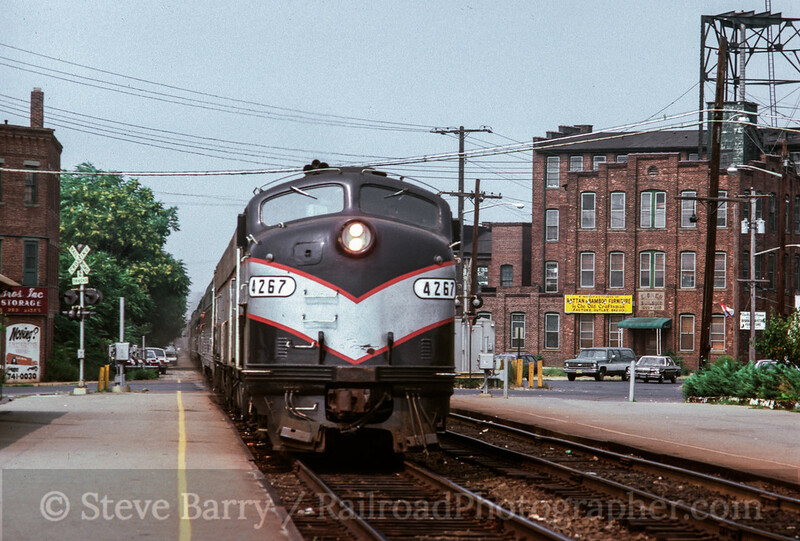 The former CNJ trains were diesel powered from Hoboken, but it was the former PRR trains that stole the show. Coming from Pennsylvania Station in New York, the trains were powered by electric locomotives to South Amboy, N.J., where the electrics were replaced by diesels to continue on to Bay Head. This locomotive change continued for several years into the New Jersey Transit era (which began in 1983) until electrification was extended to Long Branch. 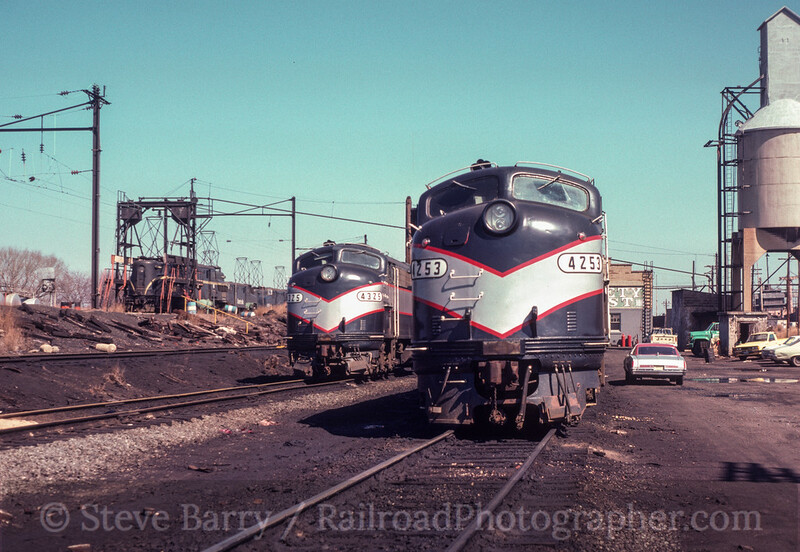 The ex-Pennsy trains were powered by E8 diesels, most of which came out of the PRR merger into Penn Central pained solid black. NJDOT adopted a nice blue scheme with a silver cigar band (see No. 4320 in the photo above), which was a not bad scheme (certainly better than the solid black). But when NJDOT turned that cigar band into a bow wave (the other two locomotives above), then they really had a nice scheme. A later variation of the bow wave had a state outline in a circle added. Bay Head Junction was the end point of the railroad, where a turning loop and yard were located. The evening and weekend lineup of trains there was always worth shooting. Further up the line at Red Bank we see a southbound train led by a pair of E8s. Note the lack of the state outline on the nose. 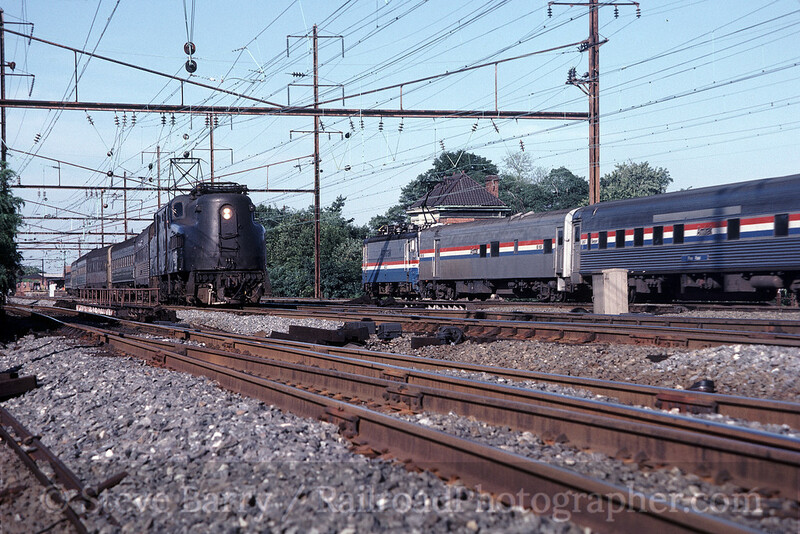 Needing to bolster its E8 fleet, NJDOT purchased additional units, including a couple from the Southern Railway, When Amtrak was formed in 1971, the Southern opted to stay out of the national passenger carrier and operated its Southern Crescent with E8s between Washington, D.C., and New Orleans, La. Southern eventually joined Amtrak, making its E8s surplus. Though battered by age, the former Crescent units were a nice addition to the NY&LB. 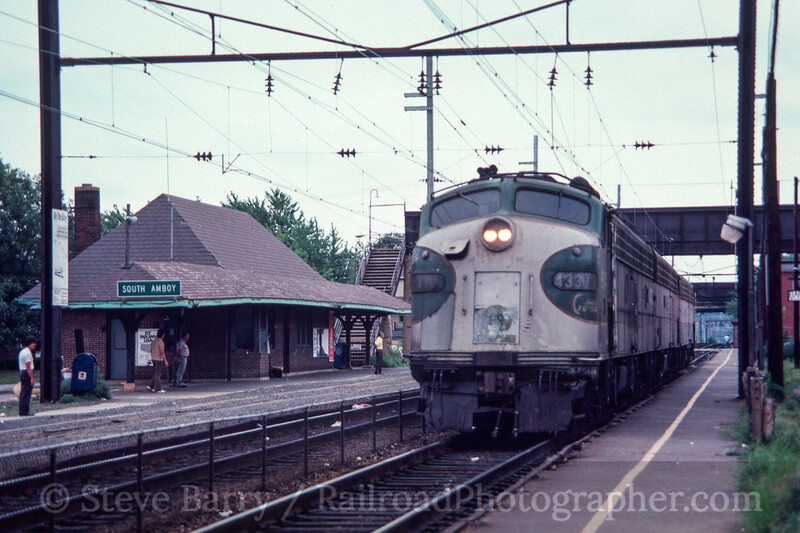 At South Amboy the E8s gave way to electrics so the train could finish its run into Penn Station. 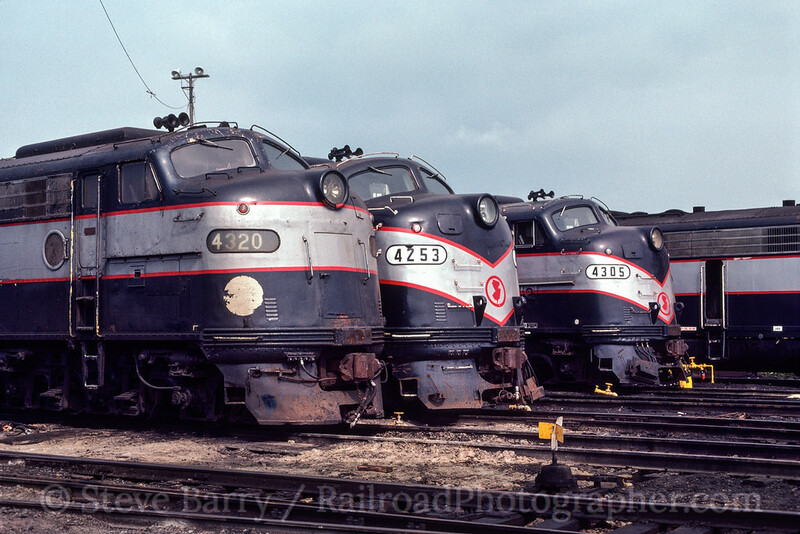 But these weren't just any electrics -- these were classic GG1 locomotives from the Pennsylvania Railroad. Indeed, the NY&LB would be the last place these veteran locomotives from the 1930s would operate. Weekends at South Amboy would find E8s and GG1s sharing the compact engine terminal. 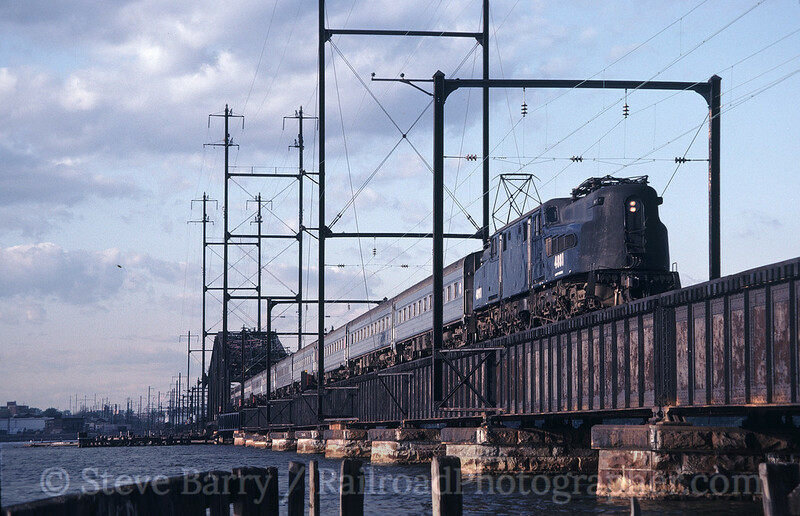 GG1 powered trains coming into South Amboy from New York had to cross Raritan Bay on a long bridge. This bridge became one of the most photographed railroad locations in New Jersey during this time period. The GG1s, much like the E8s, wore black from Penn Central. Unlike the E8s, all the GG1s (save one) never got a new coat of paint. At the opposite end of the bridge is Perth Amboy. The shore of Raritan Bay in this town became known by railfans as Bacteria Beach. It was packed with photographers on October 29, 1983, during the last day of GG1 operations. Doing the honor of pulling the last train was GG1 No. 4877, the only repainted electric motor on the New Jersey Transit roster (NJT had taken over rail operations from NJDOT and Conrail on January 1, 1983). But what a paint scheme it was painted! No. 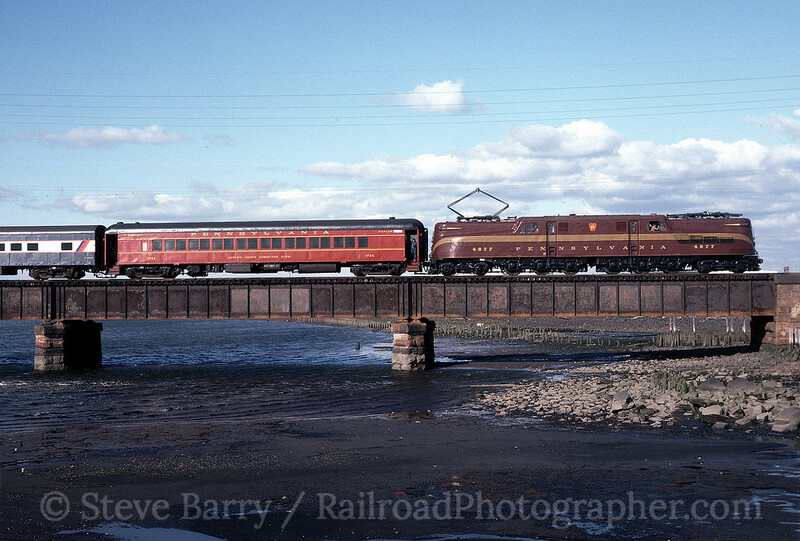 4877 received the classic Tuscan Red and five gold pinstripes of its former owner, the Pennsylvania Railroad. At Rahway the NY&LB joins Amtrak's Northeast Corridor. Amtrak had retired its GG1 fleet a couple of years ahead of NJT, replacing them with modern Swedish-designed AEM7 locomotives. So when a Bay Head-bound train met an Amtrak train, it was definitely a meeting of eras -- the last of the 1950s passenger trains meeting the trains of the 1980s and '90s. NJ DOT and Amtrak; Rahway, N.J.